To refer to the Hitch Climber as "just another micro pulley" is a complete misjustice to the team of arborist/designers that created this multifunctional hub for friction hitch climbing systems. This tool was created because of concerns of unbalanced loads placed on carabiners in work positioning systems commonly in use. The Hitch Climber Pulley when used with the Petzl OK or DMM Ultra "O" carabiner provides a balanced load to the carabiner and reduces the chance of cross loading. To the right is one of the configurations that the Hitch Climber can be utilized. 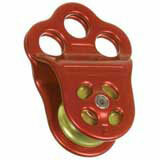 From climbing to equipment haul up lines to light weight rigging this tool can carry the leading role. To fully explain the use and detail of the Hitch Climber is impossible in this small space. Fortunately the creators have put together a brochure that is available at www.treemagineers.com. We offer the Hitch Climber in two colors for easy identification. We recommend that if you intend to use a Hitch Climber in rigging applications that you reserve one of the two colors for climbing applications to prevent improper cross contamination.